Urban Chafer Alternatives - Cal-Mil Plastic Products Inc.
Cook, serve, and showcase your arrangements of food with this fantastic alternative to conventional chafers! 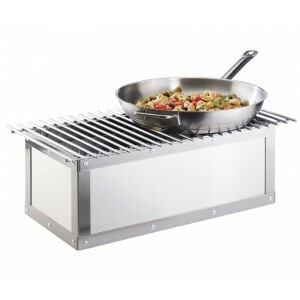 This Urban Stainless Steel Chafer Alternative will complement any table at your restaurant, hotel, or catered event! Constructed of Brushed Stainless Steel and accented by dramatic rivets. Built-in Windguards and can hold 4-5 cans of fuel.